RCMP officers will soon be carrying naloxone nasal spray to protect themselves against accidental contact with opioids such as the potentially deadly fentanyl. Commissioner Bob Paulson said he cannot overstate the danger of the powerful synthetic drug that has already killed thousands. "It's spreading across the country, leaving a trail of misery and death," he said in a news release Tuesday. "First responders and the public need to know that even being near it can make you sick, or worse." The RCMP said it will begin distributing naloxone kits to officers to use on themselves or others to reduce or reverse the effects of opioids. New procedures are also being developed for Mounties to safely handle unknown substances. The force released a video Tuesday featuring two British Columbia officers who became sick immediately after inhaling or touching fentanyl that belonged to people they came across while on the job. Const. Rob Dupuis of Kamloops said in the video that he responded to a call about a young man who was slumped over in the driver's seat of a vehicle that had numerous narcotics in plain view. Dupuis said he noticed a chemical smell and became nauseous and dizzy from what he later learned was fentanyl, and that tests at a hospital later showed his heart rate and blood pressure were elevated. Traces of opiates were also found in his urine, he said. "That was just after a 15-minute exposure in a vehicle," Dupuis said, adding that officers at traffic stops may believe they are dealing with cocaine or heroin, unaware that a substance is laced with fentanyl. Const. Dawn Adams of Kelowna said she went to check on a man slumped over a table and noticed he had dropped a folded piece of paper. "When I picked it up it unfolded and basically exploded white powder in my face," she said in the video. "I felt dizzy, I felt nauseous, I couldn't stand up very well. I had to lean over. It was a feeling of helplessness too. Very unnerving for a police officer." Adams said she felt better immediately after receiving a dose of naloxone, which is sold under the brand name Narcan. 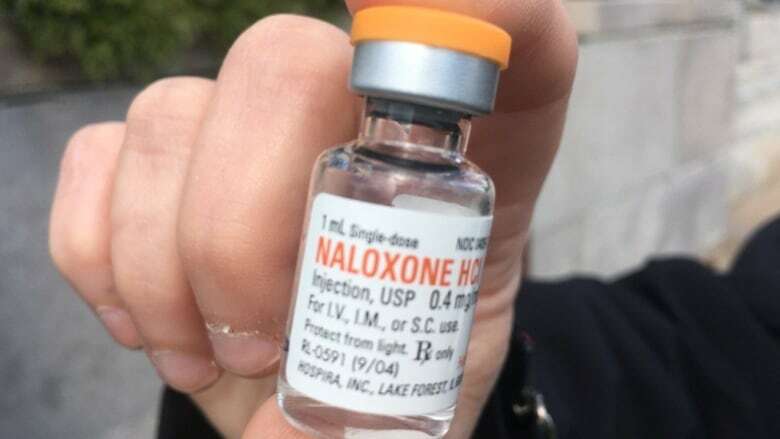 Last week, the Vancouver Police Department announced its front-line officers would be carrying naloxone spray in case of exposure to opioids, and the Abbotsford Police Department said it will be ordering naloxone kits. In British Columbia alone, the coroners' service has said there were 433 opioid-related deaths between Jan. 1 and July 31 of this year, a nearly 75 per cent increase compared with the same period in 2015. The number of deaths between Jan. 1 and June 30 where fentanyl was detected has leapt to 238, a 250 per cent increase over the same period last year. In July, the province created a joint task force involving the provincial health officer and the director of police services to identify ways to prevent and respond to overdoses. The task force released a statement Tuesday saying the RCMP's decision to equip officers with naloxone is a "positive step." "Adding naloxone to the list of tools at their disposal means they are able to keep themselves and those they serve and protect safe. At the end of the day that is what it is all about -- keeping British Columbians safe," the statement said.